Would you believe this takes half an hour to make? Fry bacon in a large skillet until golden brown. Remove from heat and place on a paper towel-lined plate. Pour off bacon drippings and reserve. Add mushrooms to pan, along with unsalted butter. Cook mushrooms over medium heat until they become tender, about 5 to 6 minutes. Remove from heat and set aside. Taste for salt and pepper. Add 1 tablespoon bacon drippings to the skillet. Add shallots and sauté until translucent, about 1-2 minutes. Add spinach to pan. Let spinach wilt, about 30 seconds. Remove from heat — the skillet’s heat will continue cooking the spinach. Give spinach a couple of quick stirs. Taste for salt and pepper. To assemble, spoon spinach and shallots onto plates. Spoon bacon mixture atop spinach. 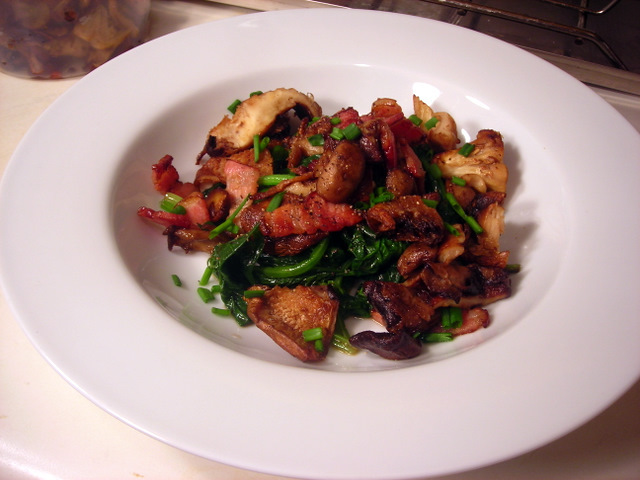 Drizzle a little fresh lemon juice atop bacon and mushrooms, sprinkle with onion chives and serve immediately. A baguette and some pinot grigio makes this a great light dinner. 28 May	This entry was published on May 28, 2011 at 10:55 pm. It’s filed under cooking, food, food photography, recipe, spring and tagged bacon, dinner, food photography, seasonal and local, spinach, wild mushrooms. Bookmark the permalink. Follow any comments here with the RSS feed for this post. Love this recipe! I always like when I run into a recipe that looks this yummy and I read down the ingredient list … and it’s low carb too!